“Back to Basics”, 13th September, all day, UCLan, Midwifery Society -PR1 2HE. Jenny presented to the students and lecturers of UCLAN about getting back to basics in skin to skin dyadic care . One of her slides asked the recommended ambient temperature for an operating theatre pre – caesarean birth of a baby – 25 degrees centigrade – which surprised everyone . Jenny presented new evidence on skin to skin contact and was given cheers at the end of her presentation . “We Are Only Human”, 14th September, all day, Coventry University, CV1 5FB Jenny presented “Professional Envy – we need to. talk about it ” which was well received and the first ever presentation on a subject which involves bullying – Jenny gave ideas and coping strategies to help overcome feelings of envy within the workplace and also helped those who were targeted because of what they do . The subject matter provoked a lot of debate and a pact was made to contemplate and challenge behaviour at work . “Why Skin to Skin matters and how to make sure it happens when you give birth”, 19th September, 19:00-21:00, Thornton Little Theatre, FY5 3SZ – self funded Profits to UNICEF . 60 members of the public attended including the Lady Mayor and Lady Mayoress of Wyre . Jenny walked and sat with the audience and used slides , music , her poems and current evidence to explain why Skin to Skin matters so much . Jenny also gave demonstrations and passed round a jar for feedback . 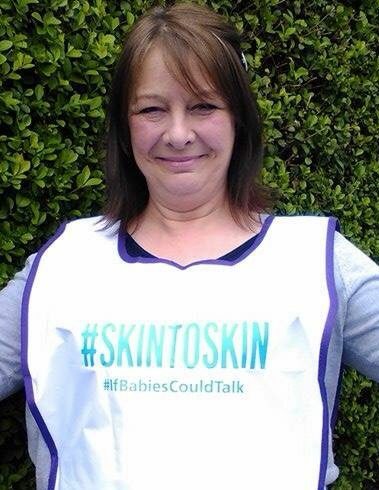 This was her first self-funded event and Jenny uses the money she makes presenting to fund this – her aim was to catch a public audience and share with them to share with others the value of skin to skin contact .